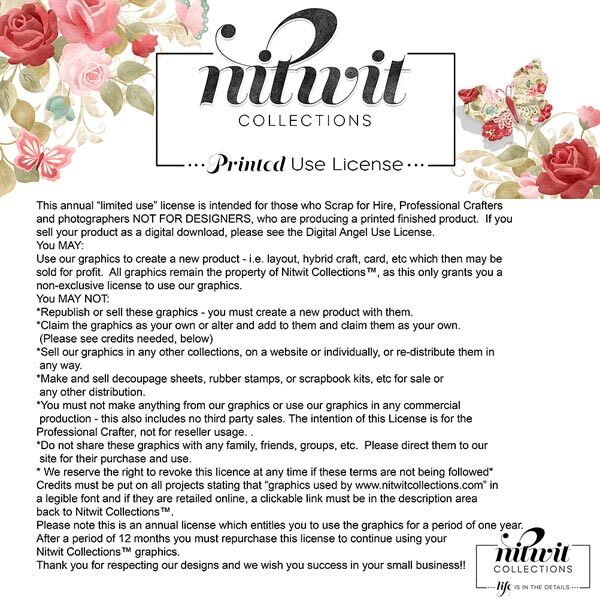 PLEASE NOTE BEFORE PURCHASING THIS LICENSE YOU NEED TO OBTAIN WRITTEN PERMISSION FROM NITWIT COLLECTIONS™ AS TO THE SPECIFIC USE THAT YOU ARE HOPING TO USE OUR PRODUCTS FOR. THIS PERMISSION IS ALSO REQUIRED AS PART OF THE LICENSE! WHEN CONTACTING US YOU MUST INCLUDE A DETAILED DESCRIPTION OF WHAT YOU WILL BE CREATING USING OUR GRAPHICS AND WHERE YOU PLAN TO SELL THESE CREATIONS (I.E. WEBSITE ADDRESS, ETC.). THIS LICENSE IS NULL AND VOID WITHOUT WRITTEN PERMISSION. This annual “limited use” license is intended for those who Scrap for Hire, Professional Crafters and photographers NOT FOR DESIGNERS, who are producing a printed finished product. If you sell your product as a digital download, please see the Digital Angel Use License. Use our graphics to create a new product - i.e. hybrid craft, card, etc which then may be sold in a final, printed form. All graphics remain the property of Nitwit Collections™, as this only grants you a non-exclusive license to use our graphics. When we receive your email with your intended usage, we will will respond to let you know if your use is allowable with this license. Republish or sell these graphics - you must create a new product with them. Sell our graphics in any other collections, on a website or individually, or re-distribute them in any way. Make and sell decoupage sheets, rubber stamps, or scrapbook kits, etc for sale or any other distribution. Make any of our graphics into Cutting Files (GSD, SVG, WPC or Studio Files, etc) for sale. You must not make anything from our graphics or use our graphics in any mass or commercial production. Do not share these graphics with any family, friends, groups, etc. Please direct them to our site for their purchase and use. Credits must be put on all projects stating that “graphics used by www.nitwitcollections.com” in a legible font and if they are retailed online, a clickable link must be in the description area back to Nitwit Collections™. Please note this is an annual license which entitles you to use the graphics for a period of one year. After a period of 12 months you must repurchase this license to continue using your Nitwit Collections™ graphics. Thank you for respecting our designs and we wish you success in your small business! !